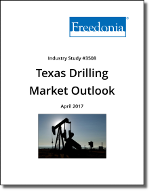 This Freedonia study analyzes the Texas oil and gas drilling outlook. It presents historical data (2015 and 2016) and forecasts (2017 and 2018) by play (Permian Basin, Eagle Ford Shale, Barnett Shale, and Haynesville Shale) in wells drilled, footage, and active rigs. Historical data is presented for drilling permits. Additionally, data is analyzed by well trajectory, resource, and sub-basin, where applicable. The study also evaluates drilling rates, drilling costs, land acquisitions, and infrastructure.